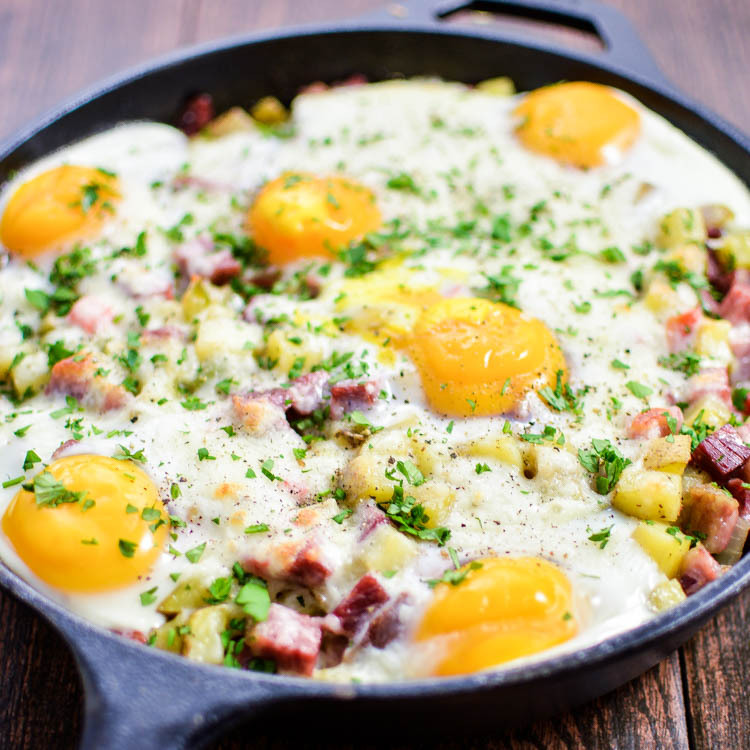 This corned beef hash baked eggs recipe is the perfect use for that leftover corned beef from St. Patrick's Day! Dovetailing tip: Remember to use the cubed corned beef from Meal 1 in this delicious recipe. In a large, oven-safe saute pan or cast iron skillet, heat the olive oil over medium heat. Add the onion, potatoes, green and red bell peppers. Season with salt and black pepper and cook for 10-12 minutes or until the vegetables are tender. Add the garlic and cook for an additional minute or until fragrant. Stir in the corned beef and remove from heat. Crack the eggs on top of the hash and sprinkle on the cheese. Bake the hash at 350 degrees F for about 20 minutes or until the cheese is melty and bubbly and the eggs are done to your liking. This time will vary depending on how well or not well done you like your eggs cooked. Remove from oven and sprinkle on a dash more of black pepper. Top with chopped fresh parsley and serve immediately.